The Braun Silk-Epil 9 has many advanced features to enhance the efficiency and experience of epilating. It has a 40% wider head than previous models. Cordless with a fast re-charge time. Adapts to the contours of your body and uses pulsating vibrations. Skin contact caps for different sensitive areas. Two speeds for gentle or efficient Epilation. In a hurry ? >> See the best price Silk-Epil 9 on amazon. Braun is a leading name in the beauty industry and one that we have learned to trust. Producing personal, electrical items that range from toothbrushes, shavers to hairdryers. They have a very popular epilator model called the silk-epil SE5280 that is a great product. The Epil 9 really expands on that model which we will look at below. One of their latest additions is the Silk-Epil 9 Bonus Edition Epilator. A complete hair removal system that removes hair by plucking it out from the root which is a lot different than a laser hair removal system like the tria beauty. Sounds painful? Yes it can be at first. They have also included a facial cleansing brush to go with this epilator. The method that we choose to remove our unwanted hair is a personal one. They all have their good points and bad points and results do vary for different people. The downside of epilating is that it is painful to begin with and this is no secret! But, by plucking the hairs out from the root, they take longer to grow back and are finer leaving you hair free for longer. Because of the finer re-growth epilating will become almost pain free depending on your skin type. With a wider head, this model will remove more hairs per stroke than most other models making the process a lot faster. The MicroGrip technology ensures that more hairs are plucked out and less are broken. Because this is a cordless model you don’t have to be sat near a plug socket. 40 minutes of use can be gained from a 1 hour charge. Designed for both wet and dry use it can even be used in the bath. The specially designed head will adapt itself to the contours of your body. As no part of our body is flat this innovative feature makes it far easier to remove more hairs using less strokes. Pulsating vibrations are used for a gentle epilation and the different skin contact caps help to protect the skin in the more sensitive areas. The Smartlight highlights finer hair or missed ones. Using the two speeds, gentle – for finer hair and sensitive areas, and efficient – for normal hairs, epilating should be a very efficient was of removing those unwanted hairs from all areas of the body. You can read more reviews and get the best price for it on amazon. It’s one of the best sellers there. As well as a cleaning brush and pouch, Braun has included a facial cleaning brush, so you are actually getting 2 products for the price of one!! A fantastic double act. It has long been known that using a facial cleansing brush is far more efficient than doing it manually. In fact, they are six times more effective. For removing make-up, impurities and dead skin cells this brush uses 60,000 micro touches per second to leave your skin feeling not only clean but softer and more radiant looking. Exfoliation is very important, not only for the health of our skin, but it also helps to reduce in growing hairs. Dead skin cells are easier to remove after a nice soak in the bath with your favorite products. We all know that heat opens up the pores in our skin which makes plucking out the hairs less painful. The Braun Silk-Epil 9 has been designed so that it can be used in the bath or shower. Follow up with a thorough facial cleanse using the cleansing brush and your favorite products. Finally, use your favorite moisturizers on your face and body to finish off. A little indulgence never did any body any harm. It is recommended to epilate at night, before going to bed, therefore any sensitivity or redness can settle down overnight. 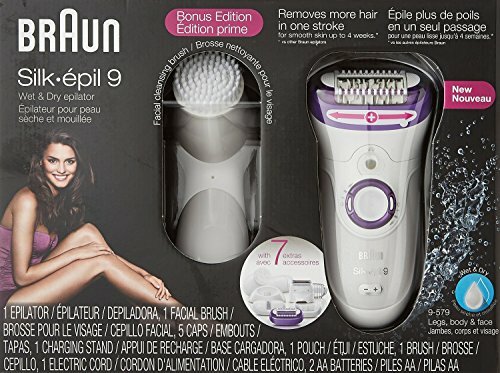 Customers who have already purchased the Braun Silk-Epil 9 absolutely love it. With a popular rating on Amazon, there are some impressive reviews. Unfortunately, as with all epilators, people tend to mark them down because of the pain or discomfort element when using them for the first time. This is, however, nothing to do with the actual product. Customers have said that it feels very comfortable to hold and use and are impressed with the design and how it looks. It has left their legs very smooth. They like the extra attachments and find the light very useful. Everybody loves a freebie and the facial cleansing brush is no exception. Customers are very impressed and pleased with it. This is an all singing all dancing epilator and is at the more expensive end of the market. So why pay more? Well, the old saying that you get what you pay for is certainly true in this case. The advanced features and adaptability bring this epilator into its own. How much do you spend on replacing razors? How many times have you nicked your skin? Do you really like the stubble or having to shave nearly every day? How painful are your waxing sessions? Are they effective enough? How much do you hate having to let your hair grow in between sessions? Can you really afford laser treatments or by one of the new DIY home laser systems? 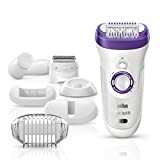 If you are replacing an epilator, how much did it cost and how long did it last? Did it have as many features? The Braun Epil-Silk 9 will last you for many years to come, so how much money will you actually save? You can buy it here on amazon.